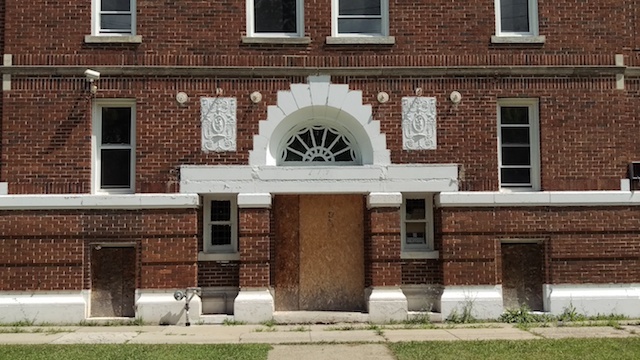 The owner of the abandoned property pictured above made the first call following its acquisition to The Energy Alliance Group of Michigan’s President, Scott Ringlein. The plan is to revive the boarded up property, and the client wanted Ringlein to develop a list of energy efficiency opportunities along with possible funding mechanisms. The property has been an eyesore for years and when the government entity holding the property saw our client’s recent conversion of a similar building, they made him an offer he couldn’t refuse. The big question was could it be made usable again? According to Ringlein, the building is structurally sound and in excellent shape for being brought back to life. The formerly upscale apartment complex will need a complete makeover as evidenced by the photo taken during Ringlein’s initial tour of the site. The tour was the first step in the process of converting the boarded up eyesore into a valuable community asset future tenants will call home. 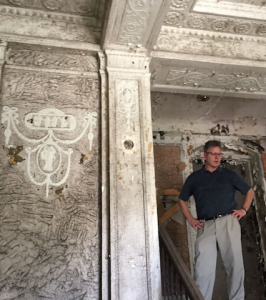 The property, originally built in the 1920’s, had fallen into decay for a variety of reasons. But as is typically the case with abandoned buildings, it’s ultimately a lack of capital. Funds for needed upgrades that keep a building’s aging infrastructure current are often difficult to access. As a building slowly deteriorates the cost to maintain it increases, and without upgrades it becomes less comfortable to live in. The resulting increased vacancy and associated decrease in revenue creates a relentless downward spiral that ends up with an unwanted, abandoned and boarded up structure. 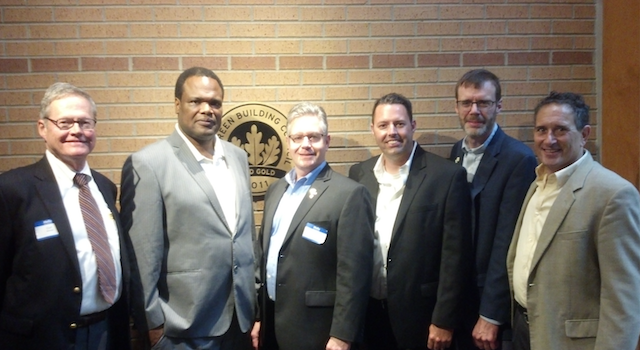 Several days after Ringlein’s tour of the abandoned property, EAG’s Vice President Curt Monhart convened a panel of experts that presented how to finance building upgrades, and more specifically, upgrades that keep a building from falling into the downward spiral of decay. While there are many options for financing upgrades, Monhart focused on the one most advantageous to keep a property current with upgrades such as lighting, HVAC, windows, doors, insulation, water conservation and renewable sources of energy. These are the options that increase comfort, reduce energy and maintenance costs, create improved tenant appeal and increase overall profitability. The PACE Administrator – Andy Levin of Lean and Green Michigan described PACE in Michigan including how the program works and its unique advantages versus traditional financing options. Levin also discussed Lean & Green Michigan’s approach to developing the Michigan PACE market and the process for establishing a PACE district. The Funding Source – Kyle Peczyski of Petros PACE Finance described the underwriting criteria and the process for securing a PACE loan. He also presented a number of case studies of projects funded by PACE. 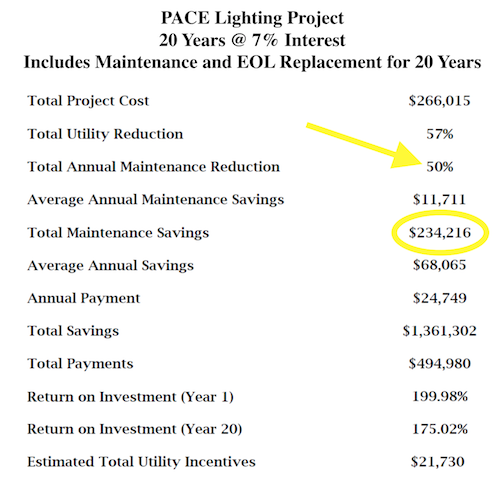 The Project Developer – Curt Monhart of EAG described why PACE is necessary and what types of projects qualify for the energy specific financing. Monhart also described how to initiate a PACE upgrade project and the unique approach EAG uses to launch projects. The Property Owner / Developer – Jeff Dombrowski from The West Michigan Housing Alliance described how PACE is a viable mechanism for funding what is often the missing element truly making housing affordable – low energy costs. He described a case where rent is affordable but high energy expenses put the total living expenses beyond tenant reach. Don’t forget the cost of maintenance! One of the points brought up during Monhart’s presentation was the fact that older buildings, and their associated equipment nearing the end of its useful life expectancy, typically have a rising cost associated with maintenance. Facilities that upgrade their equipment not only take advantage of improved energy efficiency, but also benefit financially from a significant reduction in maintenance costs. And unlike most traditional forms of financing, these costs can be included in a PACE loan. Rescuing abandoned buildings is a complex process gaining attention as the revitalization of older communities increases. Keeping buildings from reaching the point where they become abandoned is high on the list of community leaders. These leaders realize it makes far more sense to keep a building in use rather than attempting to restore it after abandoned. That dynamic depends on access to adequate capital. Every building owner has a long list of needs when it comes to maintaining a property’s market appeal. Financing that list, while maintaining profitability, can be a challenge at times. If the challenge can’t be met the building begins to lose marketability and profit. New methods of financing along with rebates, incentives and grants make ongoing upgrades to buildings more affordable. Those same financing mechanisms also make it possible to rescue abandoned buildings and restore them to their former glory, while at the same time utilizing the most up to date technology to insure tenant satisfaction and comfort. The building pictured at the beginning of this article will be featured step – by – step as the renovation project moves forward. A “behind the drywall” tour is also in the planning stages for those interested in touring the project near the midpoint of renovation. If you would like to follow this project, and be alerted to the tour, subscribe to news from the EAG by clicking HERE.